As I was browsing my pictures from Bali trip for the recent post I came up with the idea of bringing a little peace of this wonderful and peaceful place to all readers of this blog. 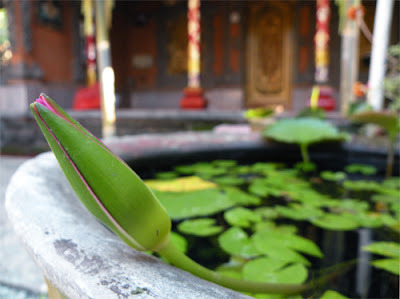 That is why I chose one of my favorite pics from Bali – a water lilly button peeking up from the huge stone bowl with golden and red ornamented columns of the traditional Balinesian house looming at the background and made a desktop wallpaper out of it. The wallpaper sizes allow to use the Bits of Bali image for PC as well as for Mac devices. I just want to say I am just all new to weblog and actually liked your web site. Probably I’m going to bookmark your blog post . You actually have fantastic articles. Thanks a lot for revealing your web site.